Mission: MOSILC advances independent living and the rights (civil and human) of people with disabilities, demanding consumer empowerment, control, equal access, and full integration. Vision: MOSILC envisions a Missouri in which people with disabilities live safely in the environment of their choice, are valued equally, and participate fully. Function: Purpose: 1. 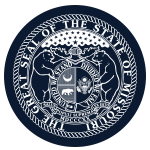 Develop a State Plan for Independent Living (SPIL) through external input, which ensures independent living for Missourians. 2. Advocate for the accomplishment of the State Plan for IL objectives. 3. Monitor, review, and evaluate the implementation of the SPIL. 4. Be a statewide catalyst for independent living. Location of meetings: Statewide, location for each posted on website. Compensation: Members receive reimbursement for meals and other realized and necessary expenses. Member Requirements: Number of members is variable based on need. At least 1 member must be the Executive Director of a Center for Independent Living chosen by the Executive Directors of the Centers for Independent Living within the state; 1 non-voting ex-officio member must be a representative from the Division of Vocational Rehabilitation - Dept of Elementary and Secondary Education; The council may include other non-voting ex-officio members must be representatives from other state agencies that provide services for individuals with disabilities; Other members appointed by the Governor may include representatives from Centers for Independent Living, parents and guardians of individuals with disabilities, advocates of and for individuals with disabilities, representatives from private businesses, representatives from organizations that provide services for individuals with disabilities, and other appropriate individuals. Members must represent a broad range of individuals with disabilities from diverse backgrounds who are knowledgeable about centers for independent living and independent living services. A majority of the voting members shall be individuals with disabilities who are not employed by any State agency or center for independent living. No member may serve more than two consecutive full terms.